I've been feeling a bit blue this past week. Fighting a cold, and feeling a little down, a persistent cough has kept up for most nights as well, leaving me incredibly tired, grumpy and irritable. Realizing just how incredibly cranky I've been, I thought it was time to do something about it. So after class yesterday, I went out, bought myself Emilie-Claire Barlow's latest album, and went home for a therapy baking session. Next week is also the last week of classes, and with assignments wrapping up, I knew that today would probably be one of the last chances we'd all be at school as a full class. I've been lucky to be in class with so many incredibly talented and all-around great people this year, and I've had fun baking for them. With the new spring season in the air, I wanted to make some cute spring cupcakes, which I thought would also help bring me out of my funk. 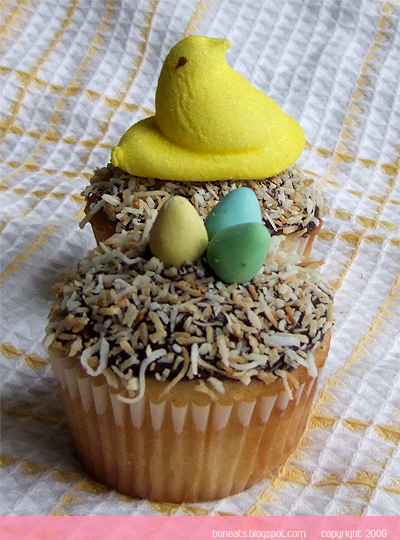 I made some simple and easy yellow cupcakes from a recipe out of Cupcakes!. I first had these cupcakes three years ago when a friend of mine made a batch for Singles' Awareness Day (a.k.a. Valentine's Day). I loved how light and moist the cupcakes were, and it wasn't until yesterday that I remembered about them again. 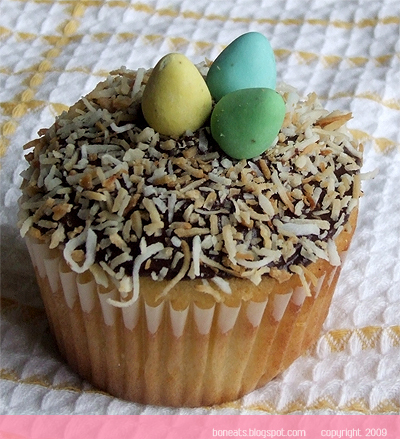 To balance the sweetness of the cupcakes, I topped the cupcakes with my favourite chocolate fudge frosting, and dipped them in toasted shredded coconut. 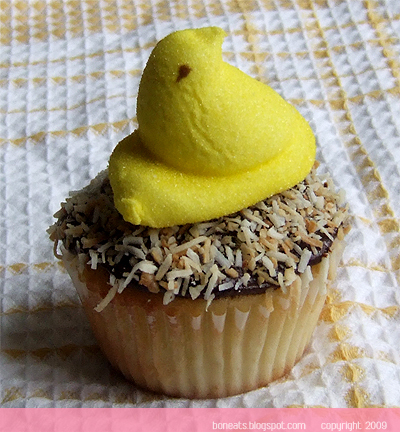 I had picked up some Peeps and Mini Eggs while I was out getting my CD yesterday, so I topped the cupcakes with them to add a final spring touch to the cupcakes. Don't they look all happy and spring-like to you? With Barlow's soothing voice blaring through the speakers, and being greeted with these cute nest cupcakes, my mood has certainly improved! 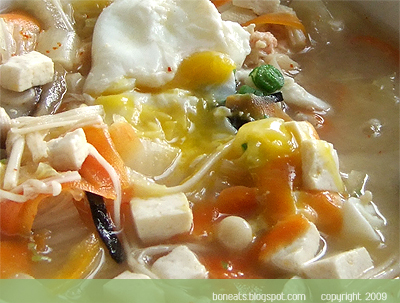 Nothing is as comforting and as heart-warming as a bowl of hot, homemade soup. What’s more, soup is such a versatile dish. Dress it up, and it can be a classy affair that will be sure to impress even your most gourmet of friends. Throw in leftover vegetables in your crisper, and a handful of pasta, rice or beans and you have a simple and rustic, but very filling meal. Best of all, soup doesn’t have to be complicated. As long as you have a large pot and some basic ingredients and seasonings, you’re set. I often make miso soup for dinner. It’s fast, it’s easy and it’s healthy. But having plain miso soup all the time can get boring quite quickly, so I like to mix it up from time to time and raid my fridge of its vegetables and throw them in the pot as well. 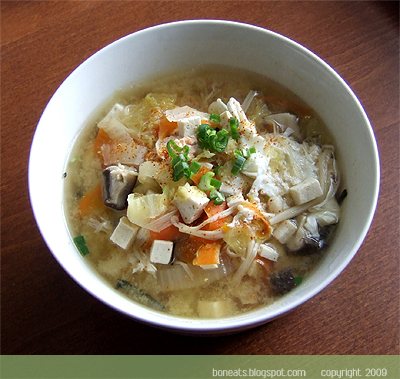 Personally, I like to add some napa cabbage and shredded carrots, which add a sweetness to the savoury soup, and some fresh enoki and shiitake mushrooms, which add an incredible depth of flavour to the soup. To make it a complete meal, you can also add a fillet of salmon or a chicken breast, cubed, and poach it with the soup, and serve it over a small scoop of rice and a poached egg. If you have the time, and the freezer space, definitely make your own dashi stock, which will be more flavourful (and certainly be MSG-free) from its instant counterpart. Feel free to use whatever vegetables you have in season (also delicious with some quartered baby boy choy), and try a different protein of choice (seafood would also be stellar!). Make it into a soup noodle dish by serving it over udon, soba or somen noodles. Who knew that a simple miso soup could have so many faces? It seems like I’ve become French this past month, and taken a strike on life. This term has been a bit crazy, with a lot going on, and ever since we finished production for On the Danforth, I haven’t had much motivation to do much else, besides the occasional school assignment. So I’ve taken an extended spring break, and haven’t done much cooking or baking in the kitchen either. But I was back in the kitchen this past week, and with a huge task at hand. 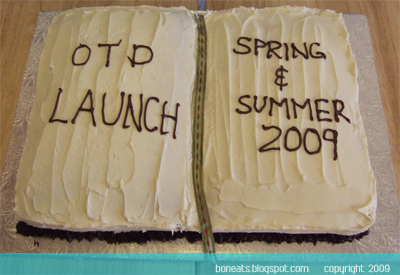 I was commissioned to bake a cake for our magazine’s launch party, and being one who’s always up to a new challenge, I agreed. 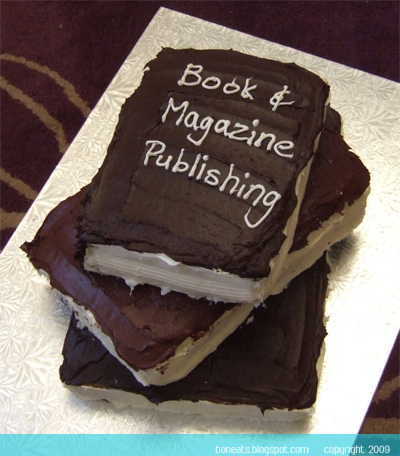 Since the cake was for the launch party, I wanted it to be a bit on the fun side, and thought it would be cute to put together a book cake, in honour of our Book & Magazine Publishing program. However, my oven is not very big to begin with (the pitiful, shrunken 28” version versus the standard 32”), so that was one of the problems I had to contend with. In order to ensure that there would be enough cake for a large crowd, I decided to bake a couple of cakes and put them together. Next was figuring out what flavour to make the cake. I decided the safest choice was to go with vanilla and chocolate, since you really couldn’t go wrong with those two flavours with the general public, right?